Junior Uma Hornish burns past the Lobos defense as she sprints to the goal. Hornish scored the Tigers' first and last goal of the game. South Pas won advanced its record to 20-3-2 following the win. 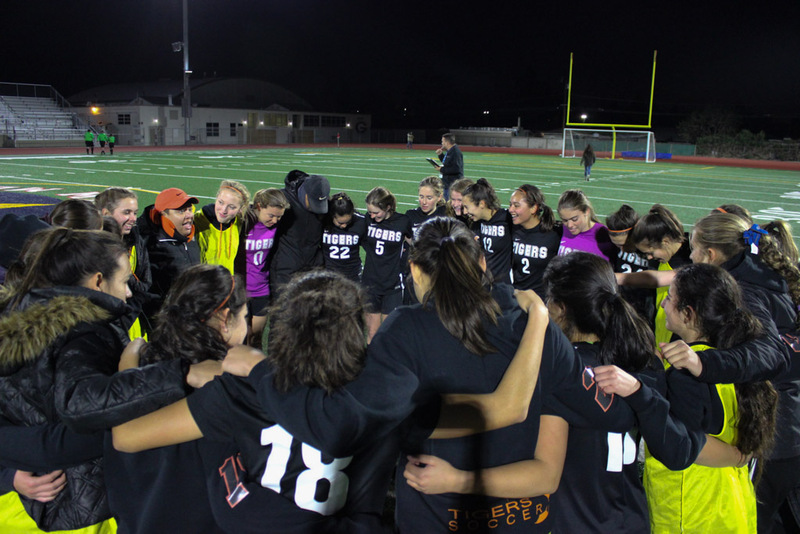 With a magnificent 4-0 shutout victory over the Los Amigos Lobos at an away match on Tuesday, February 27, the girls’ varsity soccer team has secured a chance at the CIF Southern Section Division V title. This matchup served as the ultimate showcase of the talent and skill that exists on the roster, as they shattered any previous goal-finishing troubles they may have faced in the past. 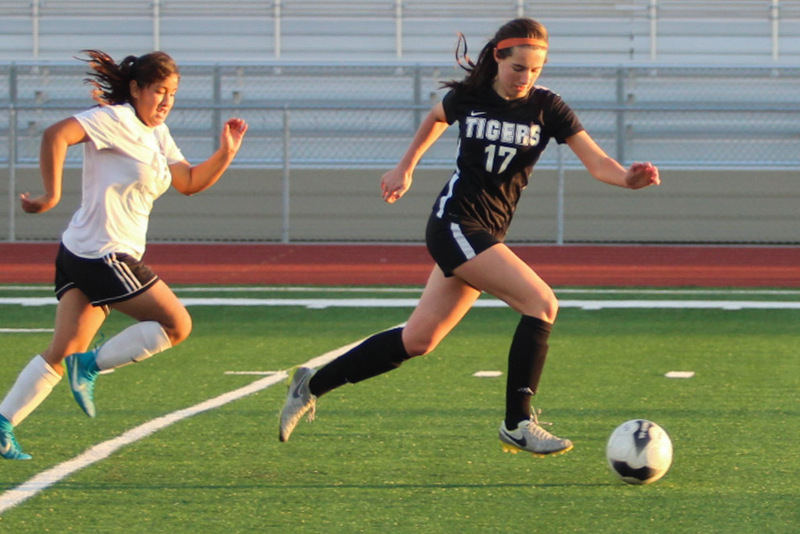 A 20-3-2 record precedes the Tigers– certainly a strong way to enter the CIF finals. The Tigers huddle up together after an ecstatic 4-0 shut out over Los Amigos. South Pas is back on the road again as they face Westminster in the championship game on either Friday or Saturday. 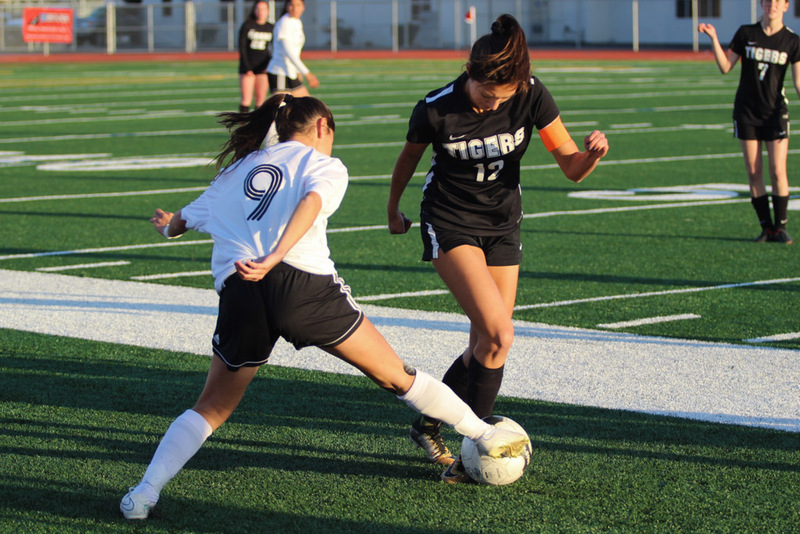 With every round of CIF, the Tigers eclipse any expectations levied upon them; while their 3-0 win over Maranatha was easily labeled as their best work, the Tigers’ marvelous play against an even more formidable opponent surpasses the former win on all aspects. The angels in the box have remained the only unwavering constant in the Tigers’ immaculate season– senior and junior goalkeepers co-captain Sophie Reynolds and Noemi Howland foiled all Lobo shots with ease. The Tiger backline functioned as a slingshot throughout the game, quickly collecting and ricocheting long balls to a competent frontline. To name a standout defender would require naming all– each defender acted as a vital individual cog in a greater machine. Meanwhile, a tireless midfield consisting of senior, junior, and sophomore Emily Dunn, Rainey Tilley, and Corey Segal amazed per usual, the trio constantly thwarting Los Amigos endeavors. Junior forward Uma Hornish led the attacking charge with her trademark elegance and cool. The Tigers celebrate their third goal together after a stunning 30 yard kick from senior Emily Dunn. Not unlike last Friday’s game, South Pas needed a grace period to attain their anticipated prowess. Admittedly, in the first ten minutes, play was precarious for the Tigers as the Lobos appeared to be dominating the field. Moreover, South Pas forwards kept getting caught in offsides traps, turning opportunities on goal into free kicks for Los Amigos. Naturally, the Tigers adjusted. Operating in the aforementioned slingshot mechanism, junior defender and co-captain Alyssa Bonk reversed a Lobo play and sent flying a beautiful long ball. Tilley then helped it past Lobo defenders with a gentle touch, giving Hornish a perfect scoring window. Her finish was the culmination of Hornish excellence, as she dribbled the ball all the way up to the keeper, juked her out, and slid in a saucy flick-of-the-foot goal. 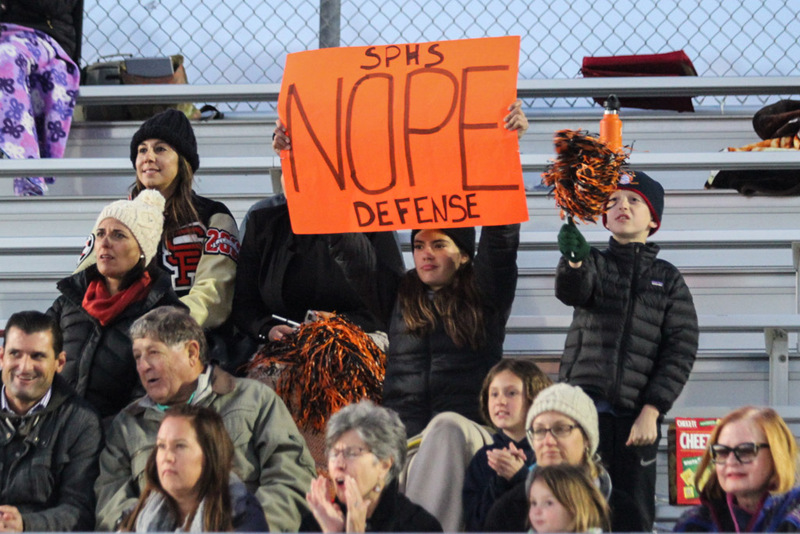 Putting up that first point held the Tigers out until halftime; any early doubts in South Pas were extinguished as the orange and black layed out supremacy on the field. Junior captain Alyssa Bonk battles for the ball in the midfield. When the second half rolled around, South Pas eager to prove themselves even further. The trend of Tiger ball authority continued with the welcome addition of the most exquisite goals one could imagine. The second goal bloomed out of a deflection from the far right corner of Los Amigos terrain. Dunn found herself situated in a somewhat awkward position, 30 yards out from the box. Despite this, Dunn unleashed the most gorgeous first-touch punt seen in South Pas’ season, which arched perfectly into the net. Tigers proceeded to assault the Lobo box, resulting in the type of backline tangle that arises from a panicked defense. Dunn swooped in again, crossing a ball out of a flurry of feet and bodies towards the always-available Tilley. Executing her third header-goal in three consecutive games, Tilley knocked the ball cleanly beyond the Los Amigos’ keeper’s outstretched hands. In a true measure of character ten minutes out from the close, Reynolds sustained a nasty ball-to-face injury while valiantly defending her box. This is the fundamental ex-factor behind this particular team; regardless of their untouchable lead above the Lobos, the Tigers still played with complete heart and soul. Hornish only emphasized this characteristic with the fourth and final goal of the match. Taking an assist from senior forward Isabella Gonzalez, Hornish made a last-ditch cross that absolutely annihilated all Los Amigos’ hopes of comeback. The Tiger cheering crowd was enthusiatic tonight despite the cold weather. A new sign has been added since the first CIF playoff round. 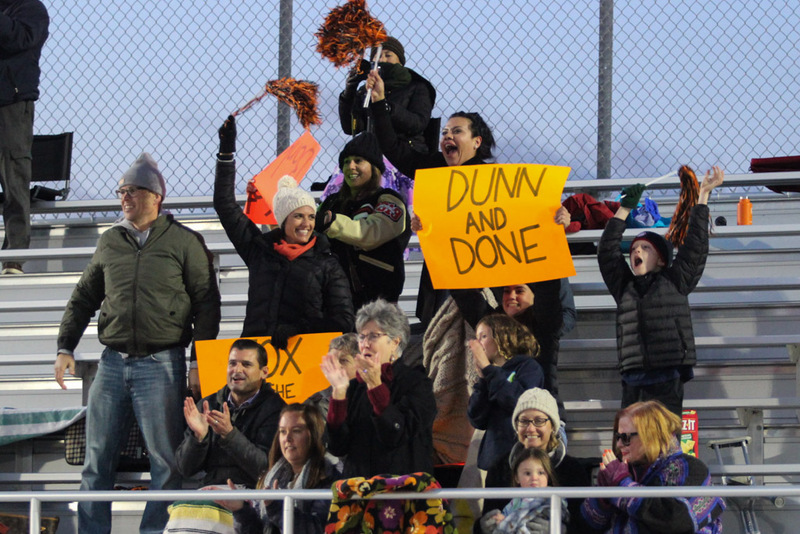 The crowd goes wild after senior Emily Dunn’s beautiful goal, further silencing the team’s opponents. 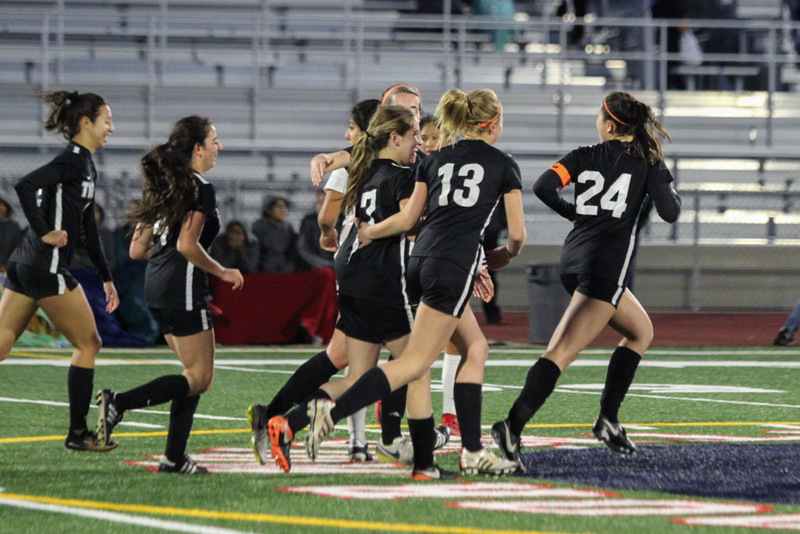 The pinnacle of the soccer season approaches South Pas as they are thrusted into CIF finals. The Tigers will be facing off the Westminster Lions in this final matchup, a rather fitting opponent to decide which clan of cats will be crowned rulers of the wild frontier that is CIF. Westminster succeeded in their semi-final match with a 4-0 win as well, making them threatening challengers for the throne. This showdown will most likely occur this Saturday, March 3 in a neutral location that is yet to be announced.